As many of you know, I was sidelined for several months this past spring by a serious illness and a long recovery. But I'm glad to report that I am back in business. Not quite up to speed yet, but getting there. Everyone whose friendship kept me going has my heartfelt thanks. Now I am anxious to get back to art! 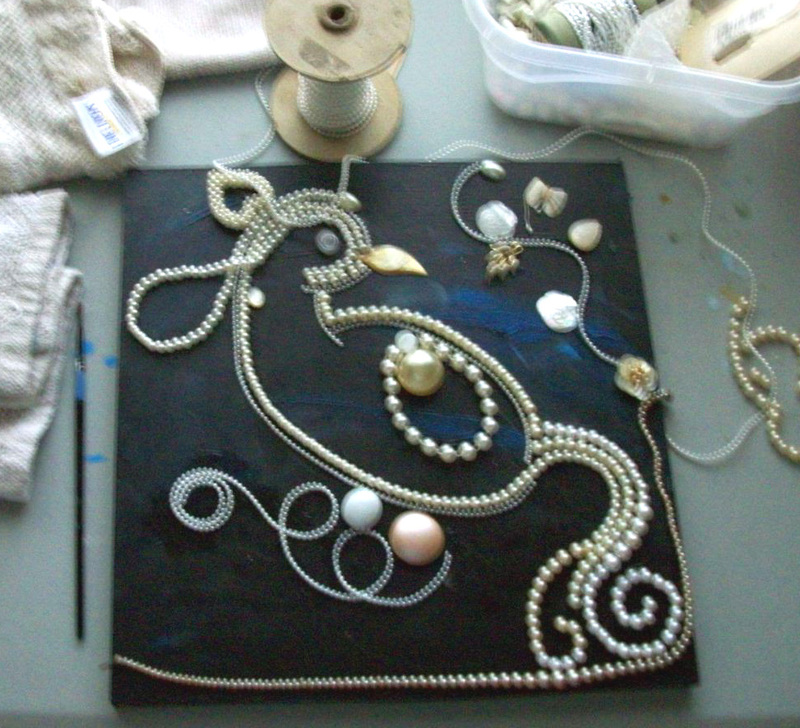 I have several projects in the works, one of them this bird-in-progress that was inspired by the buckets (OK, not buckets, but boxes and bins) full of faux pearls in various sizes and shapes that I've collected over the years. Sometimes it's the materials that inspire a design, rather than the reverse: starting with a design and then choosing materials for it, which is the usual pattern. When I started it, last fall, I didn't have a finished product in mind. I still don't, but I find it evolving every time I sit down at my work table to look at it. Sometimes I add a string of pearls; other times I just stare at it for a while. Recently I found a perfect white shadowbox frame for it, which is an impetus to finish it. I'm thinking right now of filling in the body with more lines of pearls -- at least a few, not sure if I want to completely fill it -- and maybe fill the background with clear beads (since I painted the substrate) or black and dark blue ones. I'll just have to try some and see how they look. Just like life -- you keep trying until it works.